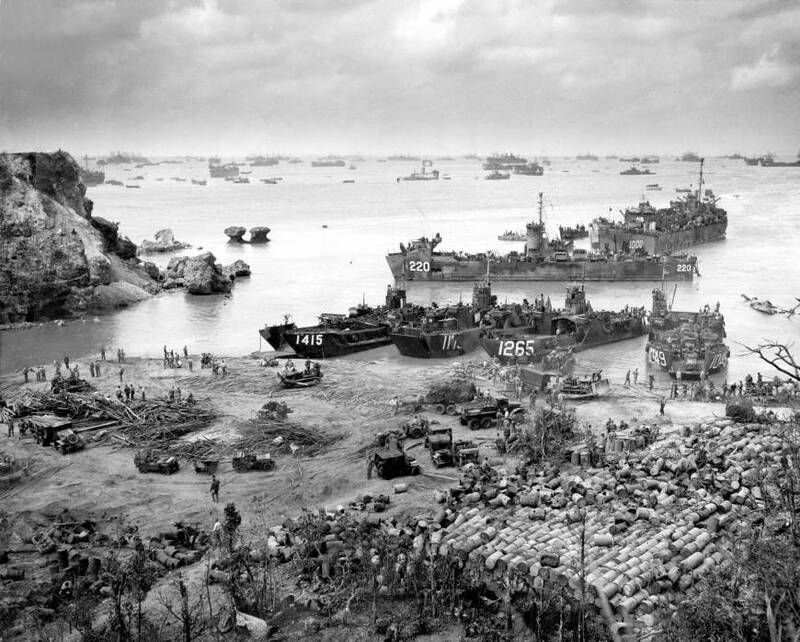 The US 77th Infantry Division lands at the Kerama Islands located South-West of mainland Okinawa. With further landings, the US secure a staging post for the eventual invasion of Okinawa. The official start of the Battle of Okinawa. On the morning of April 1st, US navy ships rained a pre-landing bombardment of 44,825 shells, 33,000 rockets and 22,500 mortar shells plus napalm attacks by carrier planes on the invasion beaches (Tsukiyama 1999). Two US Army divisions land along the southwest coast of Okinawa, with zero opposition and almost no casualties. The US Marines sweep through Northern Okinawa with ease, taking two airfields and encountering very little resistance. They encounter only third-rate troops, mostly technicians and other non-combatants drafted into Japanese defensive units, lightly armed and untrained. Many thousands of civilians turn themselves in to Marines. As the US advance North with surprising ease, a picture slowly emerges from prisoner interrogations: The main Japanese effort had gone into deeply fortifying the southern portion of the island. The American troops finally locate the Japanese defenders along the southern portion of Okinawa. Heavy defences are noted. As American forces move further inland, the battle for Okinawa intensifies. Pockets of dug-in Japanese defenders become increasingly concentrated the more inland the Allied forces go. The American forces split to cover two separate assault fronts. Up North are the Marine divisions, and down in the South are the Infantry divisions. 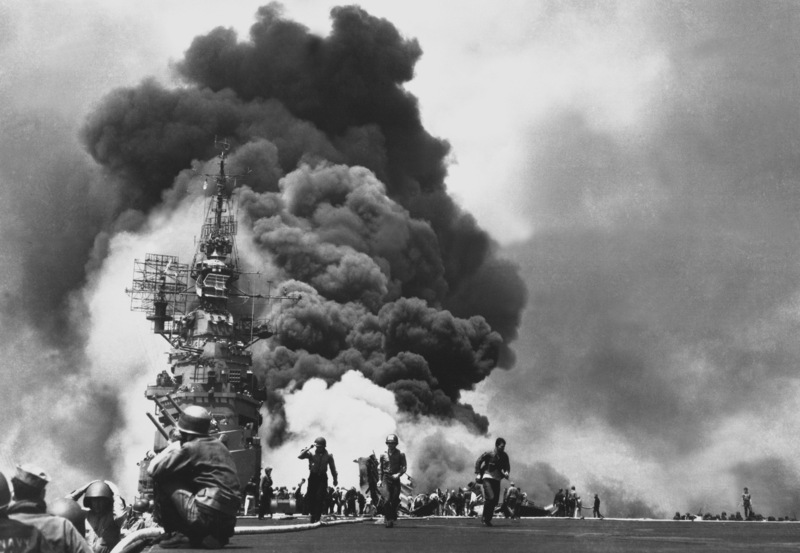 On April 6, over 400 Kamikaze planes were unleashed on American Naval vessels in the Pacific. These aircraft appear as coordinated airstrikes and prove deadly to both sides. Twenty American ships were sunk and 157 damaged by this violent air attack. For their part, the Japanese had lost more than 1,100 planes to Allied naval forces. Between April 6 and June 22, the Japanese flew 1,465 kamikaze aircraft in large-scale attacks, as well as around 400 sorties. American intelligence underestimated the number of Japanese planes by around 700 (HistoryNet n.d.). 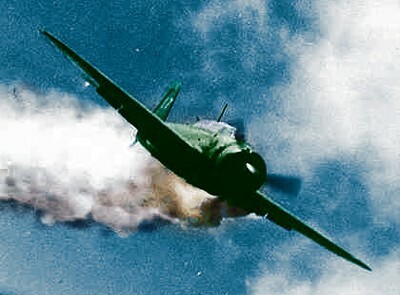 Operation Ten-Go was the Japanese attempt at a naval counter-attack. The strike force consisted of 10 surface vessels, led by the super battle ship Yamato - the largest war battleship in the world. An American submarine spot these ships very early, helping them to prepare for the attack. At this point in the war, Operation Ten-Go was considered a complete suicide mission, and it's sole objective was to desperately slow down the American navy. With no air cover, the vessels are were blasted to bits by over 300 American aircrafts (Global Security 1996). Over a two-hour span, Yamato was sunk in a one-sided battle, long before she could reach Okinawa. The island of Ie Shima lying 7 kilometres west of Motobu peninsula (The main stronghold) held one of the largest airfields in the Asia-Pacific region and was vitally needed to provide air support to the assault on Okinawa. On April 16, aerial and naval artillery, rocket and mortar bombardment saturated Ie Shima to soften up the beachhead landing of the U.S infantry division. The area was defended by an estimated 7000 soldiers, many of whom were in hidden underground guard posts, caves and tunnels. Although the Japanese were encircled, they managed to hold off the American troops for 6 days using their heavy fortifications. On April 21 Ie Shima was declared secure after 4,706 Japanese were killed and 149 captured with 1,500 Okinawan civilians dead. The success came at a cost of 172 Americans killed, 902 wounded and 46 missing (AWM 2005). 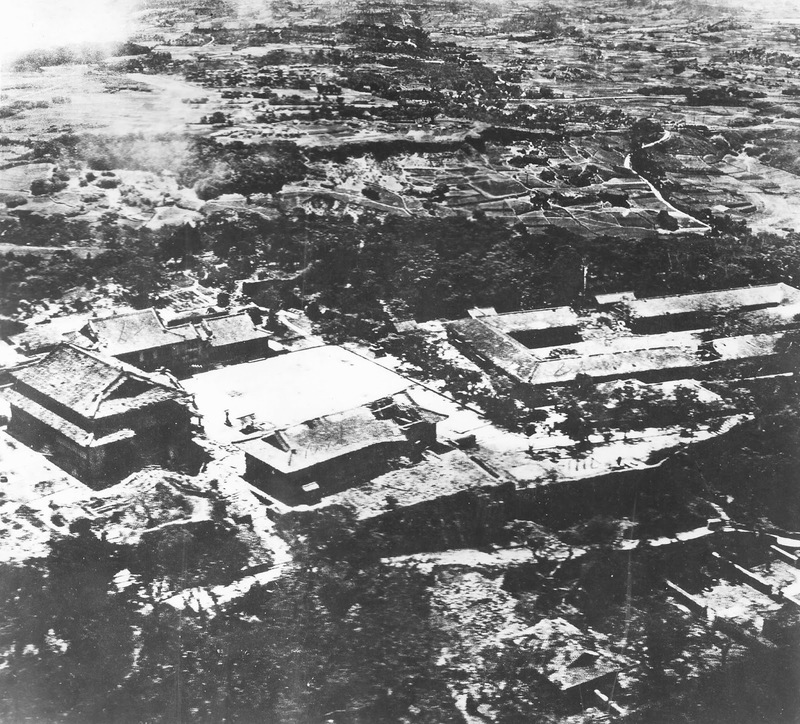 The US begin taking key defensive strongholds surrounding the all-important Shuri Castle, which was the largest and most heavily fortified Japanese base. Chocolate Drop Hill - A circular ring of higher terrain that surrounded the entire castle. Lastly, they captured the capital city of Naha, another stronghold to the West. The US forces had essentially advanced from all sides, forcing all Japanese defenders into the centre of the island - the Shuri Castle. On the 29th of May, the US finally took the crucial Shuri Castle. However, since they began artillery fire a week beforehand, the majority of Japanese defenders had retreated. Although they were able to escape, the Japanese were left with no organised form of defence. Ultimately, Shuri was left in complete ruin after being pounded by 200,000 rounds of naval and artillery gunfire and aerial bombing (National Archives 2002). U.S. 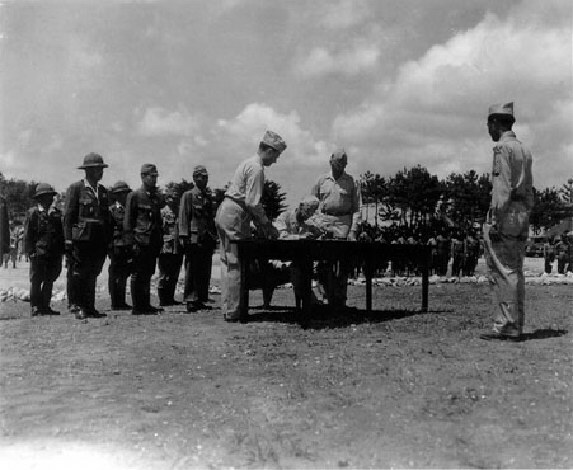 Generals offer surrendering terms to Japan. With no response from the Japanese, the U.S. steps up their aggression. The American forces slowly kept advancing, and divided the already depleted Japanese defence into three segments. This meant the Japanese could not organise any orchestrated defensive actions or counter-attacks. The division of the Japanese defence was a key turning point for the American and Allied Forces, as it was the final step in officially capturing the Okinawan islands. 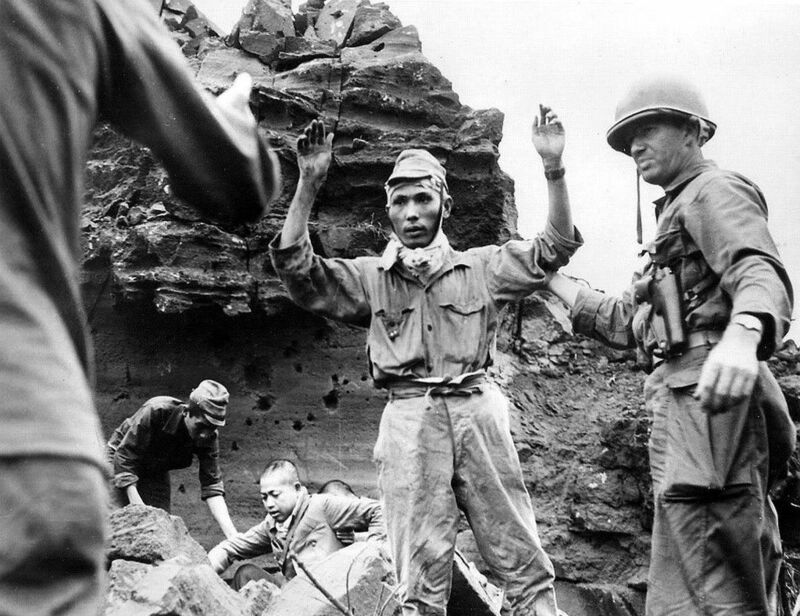 Understanding that defeat is imminent, Japanese Lieutenant General Mitsuru Ushjima commits ritual suicide with his staff after reporting the loss of Okinawa to his superiors. The Battle of Okinawa officially draws to a close as American forces overwhelm the island's determined Japanese defenders. It now represents the all-important staging area for the Allied invasion of the Japanese mainland. 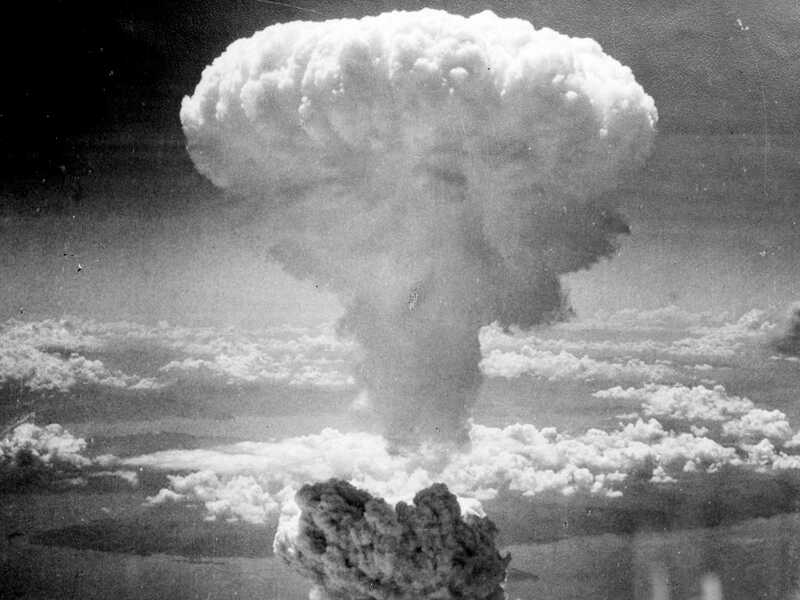 The atomic bombs were dropped on the mainland cities of Hiroshima and Nagasaki, and quickly lead to Japan's total surrender. This caused many to question the necessity of the entire Battle for Okinawa, since in the bigger picture, it was a meaningless and empty victory for the US. Ultimately, the largest sea-land-air battle in history sparked three months of desperate combat, leaving Okinawa a "vast field of mud, lead, decay, and maggots." More than 100,000 Okinawan civilians perished, with over 72,000 American and 100,000 Japanese casualties (Frame 2012). Trueman, C 2016, The Battle of Okinawa, The History Learning Site, accessed 6 September 2017, http://www.historylearningsite.co.uk/world-war-two/the-pacific-war-1941-to-1945/the-battle-of-okinawa/. Tsukiyama, T 1999, Battle of Okinawa, THE HAWAI'I NISEI STORY, accessed 6 September 2017, http://nisei.hawaii.edu/object/io_1149316185200.html. HistoryNet n.d., Battle Of Okinawa: Summary, Fact, Pictures and Casualties, accessed 6 September 2017, http://www.historynet.com/battle-of-okinawa-operation-iceberg.htm. Global Security Org 1996, Military Battle of Okinawa, accessed 6 September 2017, https://www.globalsecurity.org/military/facility/okinawa-battle.htm. AWM London 2005, Okinawa Attack on Japan, 1945, London, accessed 6 September 2017, http://www.awmlondon.gov.au/battles/okinawa. Frame, R 2012, Okinawa: The Final Great Battle of World War II, Marine Corps Association, accessed 6 September 2017, https://www.mca-marines.org/gazette/2012/11/okinawa-final-great-battle-world-war-ii. Warrior n.d., Historical Analysis: the Battle for Okinawa, accessed 6 September 2017, http://scout.com/military/warrior/Article/33-Photos-From-the-Battle-for-Okinawa-101458847.